This is an X-Cell Sport 60. It has a few upgrades including a longer boom, twin tail supports, carbon-fibre frames and a rear mount tail servo. 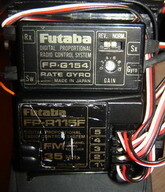 All of the radio gear is Futaba, including the GY-501 gyro, matched digital servo, the Governor and the six servos (the extra one being for in-flight mixture control). It has a PCM receiver and 2400mAh five cell flight pack. The engine is an OS 61 WC.